If your kids spend time chatting or playing computer games, they can be approached or threatened by the strangers. Internet has anonymity, and anonymity means impunity in the minds of molesters. The solution? Violate their anonymity by monitoring your kids' activities! REFOG Keylogger is designed to deal with extended families, but it fits small families just as easy. Allowing you to monitor your children activities remotely over the Internet, REFOG Keylogger does not even require your close presence in order to be alerted about suspicious activities of either your children or someone they chat with. REFOG can be set up and used by anyone. The monitor does not involve a steep learning curve and does not demand a degree in Computer Science to configure and operate. Simply download your free trial version and get yourself going! REFOG Key logger keeps a list of all activities you specify it to log. It records all visited Web sites, keeps logs of chats and instant messenger conversations as well as other things typed or received by your kids in chats, messengers, blogs, forums and other online and offline applications. REFOG app saves each key pressed and every phrase typed, and makes periodic captures of the computer screen to better illustrate what was going on at that moment. REFOG Keylogger captures every key that they press, but does not stop there. Individual keystrokes are of little use when analyzing your kids' behavior. REFOG software can detect popular chats and instant messengers, and forms clearly legible and readable logs containing chats and instant messenger conversations formatted in a manner that is convenient to read. For even better protection, REFOG app can be completely hidden from your kids' eyes. It runs silently and unobtrusively on their PC while taking screen shots and recording every key that they press, logging applications that they use and Web sites that they visit. If you are running the Windows operating system and are looking for a quality monitoring tool there are keyloggers which are compatible with Windows 7, 8, 8.1, 10. Although people who are knowledgeable about key loggers tend to feel that they are associated with malware, a keylogger can also be used for positive purposes. Before you install a Keylogger it is important to understand how it is legally used and some of the functions it serves. 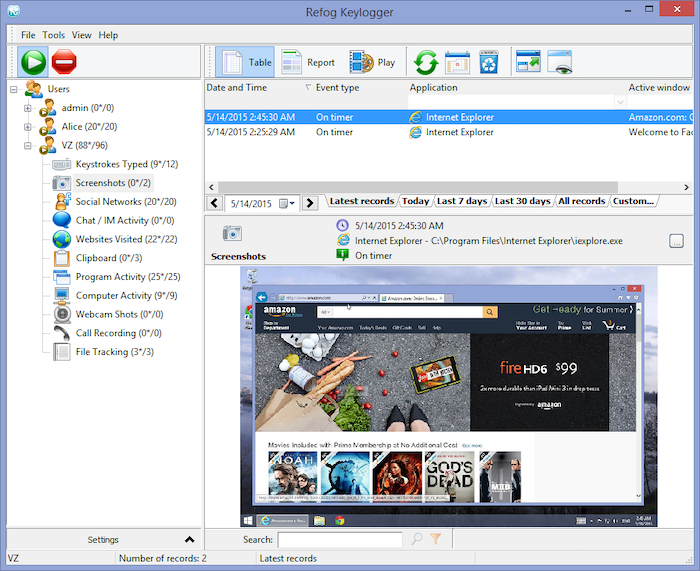 Keyloggers for Windows can be deployed by parents who want to monitor their child’s activities during computing sessions and employers who are seeking a way to track the performance of their employees. A Keylogger can also be used as a means for protecting data and passwords in the event of an operating system crash. The answer to this question is "yes" and "no" because it depends upon how it is being used. If you are using it to monitor your child's activity for the purpose of maintaining their safety online then it is legal. When it comes to employee monitoring as long as you are using it in a location where the laws permit this type of monitoring then it is legal. A Key logger can be illegal if you are using it for criminal purposes such as stealing personal data and financial information. It is also illegal if you are installing as malware on the person's PC without their knowledge. Can a PC User Disable a Keylogger? No. As long as you are using a quality Key logger that runs in stealth mode and goes undetected by the PC user. If the keylogger is inferior software that reveals its presence then it is highly likely it can be disabled by any savvy PC user. A quality software is capable of recording websites which are visited, conversations in instant message and chat programs, documents which have been accessed, applications which were used, and screenshots of PC activities, keystroke activity, and monitoring of websites with questionable content. Can Anyone Access the Data which is Recorded? No. As long as the program provides a way for you to setup password protection. There are also programs that allow you to access the recorded data simply by logging into your email account. Is a Keylogger Time Consuming to Use? No. As long as you use programs that are well designed you should be able to "set it and forget it". The program should also be capable of automatically updating itself as soon as new patches and updates are released. How Can I Determine if a Keylogger Will Work for Me? Most quality keylogger programs which are designed for Windows will provide you with the opportunity to try it for free for a specified period of time. A free trial allows you to test drive the program to determine if it works for you before you commit to paying for it.